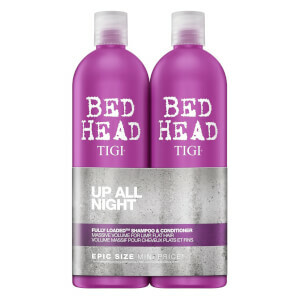 Amplify limp, lack-lustre hair with the TIGI Bed Head Massive Volume Shampoo, Conditioner and Styling Cream Set; a trio of volumising haircare products that cleanse and nourish locks whilst lending body and dimension. Combining a mega-sized volumising shampoo and conditioner duo with a thickening styling cream, this three-piece set is all you need to create full, luscious locks every time. 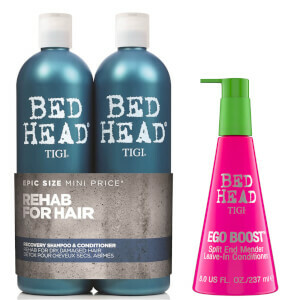 A thickening styling cream that builds body and amplified volume for frizz-free, plumped-up texturised ‘dos. Perfect for adding mass and density to thin locks, it helps to create thicker-looking mane whilst offering intense moisturising properties, thanks to pro-vitamin B5. Infusing locks with its delectable Blueberry aromas, it harnesses the smoothing powers of anti-static agents to ensure a sleek, polished finish with zero flyaways. Volumising Cream: Use 2-3 pumps on wet hair. Blow dry and style as desired. Volumising Cream: Water (Aqua/Eau), Cyclopentasiloxane, VP/DMAPA Acrylates Copolymer, Polyquaternium-37, Helianthus Annuus (Sunflower) Seed Extract, Fragrance (Parfum), Simmondsia Chinensis (Jojoba) Seed Oil, Helianthus Annuus (Sunflower) Seed Oil, Propylene Glycol Dicaprylate/Dicaprate, Phenoxyethanol, Cetearyl Alcohol, Bacopa Monniera Extract, Panthenol, Polysorbate 60, Dimethiconol, Benzalkonium Chloride, PPG-1 Trideceth-6, Styrene/Butadiene Copolymer, C12-15 Alkyl Benzoate, Disodium EDTA, PEG-4 Dilaurate, PEG-4 Laurate, Sorbitan Oleate, Citric Acid, Iodopropynyl Butylcarbamate, PEG-4, Butylene Glycol, Tocopherol, Hexyl Cinnamal, Linalool.